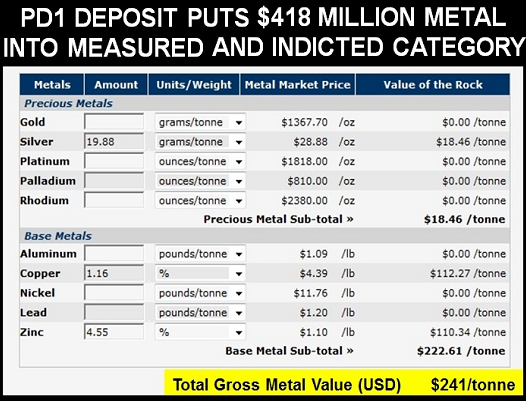 Donner Metals (TSXV: DON) just released a NI 43-101 compliant resource calculation for the PD1 deposit in its Xstrata (XTA-L) - partnered zinc project in Quebec. The 1.74 million tonne Measured and Indicated resource grades 4.55% zinc, 1.16% copper and 19.88g/t silver located between 25 and 515 metres vertical depth and is based on 24 new holes drilled. The grade and tonnage extrapolates to a $418 million resource at today's spot prices, obviously not including capital and mining costs. Not a bad kicker for company with a market cap of $29 million. The measured resource calculated for the upper portion of the deposit is based on 24 drill holes completed in 2010, combined with 14 historical drill holes completed between 1973 and 1976. Average drill spacing for the measured resource is about 20 metres. The indicated resources are based on 36 historical drill holes with an average drill spacing of about 60 metres. Xstrata is confident that the inclusion of the historical data is warranted and gives an accurate representation of deposit geometry and assay results based on comparison with the 2010 drilling. 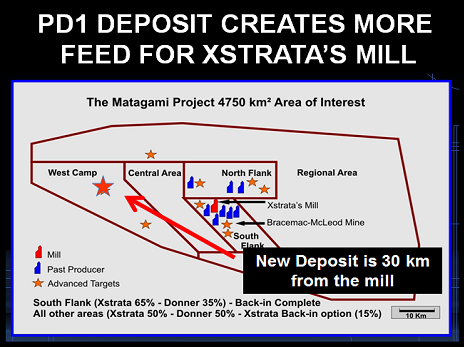 The PD1 deposit located in the "West Camp" area of the Matagami Project, about 30 kilometres from Xstrata's Matagami mill. Currently Xstrata and Donner are constructing a joint venture zinc mine on the Bracemac-McLeod deposit which is immediately adjacent to Xstrata's 2,600-tonne-per-day Matagami mill complex which will require new feed when Xstrata's Perseverance zinc mine closes in 2012. Zinc is a big story that is getting bigger. An infrastructure commodity with no viable commercial substitutes, it is the key ingredient in galvanized steel. 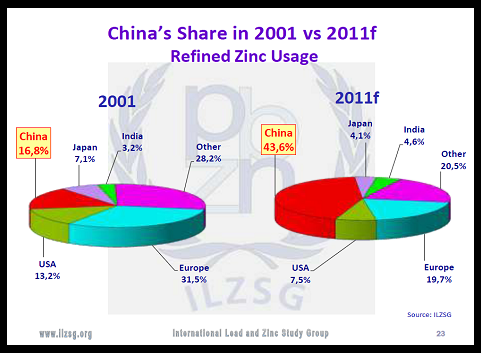 China's imports about 15,000 tonnes of zinc every month. China's share of world demand has grown 260% in a decade. 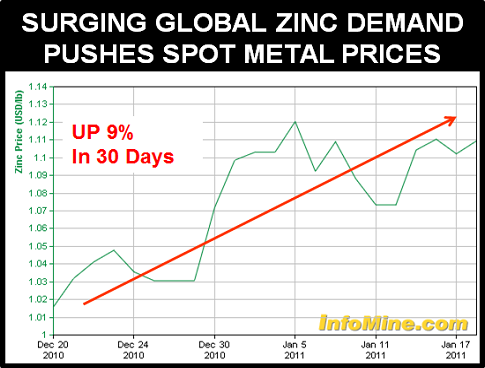 These macro-fundamentals are having an effect on zinc spot prices. Donner has the option to earn a 50% participating joint-venture interest in the Matagami project by spending $25 million on exploration before May 31, 2011. They have already spent over $24 million. In total the Matagami mining camp boasts historical production of over 9 billion lbs. zinc and 1 billion lbs. copper.